I’m using a photo from Flickr for Photo Friday today, much as I would love to be sharing the photos I took while we were in Venice When I wrote about navigating Venice by Vaporetto, I ended by alluding to our crapo-vapo day when I goofed so gloriously that my kids will probably bring it up in their wedding speeches. It was a hot day, like a really, really hot day. We should have just found a shaded piazza and spent the day lounging, reading and eating gelato by the bucketful, but that would be contrary to my native “I exist, therefore I must be moving” style of traveling – and living, if the truth be told. Instead, I thought we should go out to Murano to see how glass-blowing is done Venetian-style. To see the glass, of course, but also to take advantage of the fact that since Murano is an island in the lagoon we’d have to take a boat out there and – so my twisted logic went – the breeze on the boat would be cooling. Also, taking my kids to a glass furnace is is less crazy than it might sound since thanks to Dale Chiluly, glass-blowing features heavily in the Pacific Northwest art scene and my boys have seen all parts of the process through visits to the Tacoma Museum of Glass . What’s not to like? A huge furnace, monster steel rods, glowing blobs of molten glass – all things which any child would find fascinating. So far so good. And then it wasn’t. 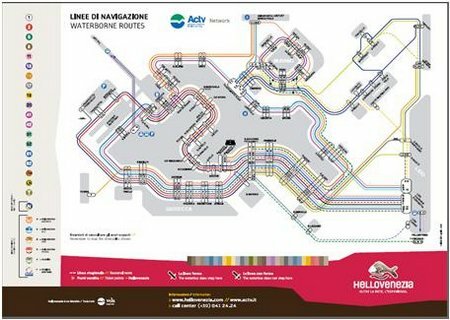 You see, as Jamie from TravelSavvyMom pointed out in her comment on my vaporetto post, vaporetto stops are confusing. The main reason is, unlike buses or trains or other, more common forms of public transportation, vaporettos going opposite directions (e.g. #41 E and #41 W) stop at the same vaporetto stop. The bigger stops have two gangways – one each for passengers going in each direction. The smaller stops, on the other hand, have only one gangway and while the number on the boat is large and easy to read, the direction is not. So you’ve guessed it. Yes, on this steamingly hot day, I took my poor husband and children onto a vaporetto going the wrong direction on a circular route. Which wouldn’t have been so bad, except that this particular route circumnavigated the entire island (of Venice). To add insult to injury, vaporettos don’t have air-conditioning or much cross-flow of air within the passenger area. Man, was it hot! Within one or two stops, the WanderDad and I figured out the mistake, but we opted to stay on the boat thinking that our children – who, at that point were sitting underneath a window and quietly reading their books – might not even notice. That was while we were passing along the quieter, more industrial side of Venice. Once we hit the busier parts of the city, things went downhill fast. People piled onto that boat like it was the last lifeboat on the Titanic and consequently, my children articulated their discomfort at the tops of their voices – there are times when I dream of a little British Isles reserve from them, but it’s been noticeably lacking so far so I’m not holding my breath. At home, I refer to CAM as my ‘pet troglodyte’ because he genuinely prefers to be in our dark, cool basement on a hot sunny day. He has no tolerance for heat, poor guy. He berated me from about San Marco all the way back to the stop where we had originally caught the vaporetto and then some. I kept passing the bottle of water and hoping for an end to come soon. But just to show the resiliance of children: within moments of stepping off the boat onto the island of Murano, (penitential monstrous gelatos in hand) we came across a small, family-friendly glass shop. The display items were glued to the shelves – how cool is that? The ‘horrendous crossing’ was immediately pushed out of the boys’ minds as they ooh-ed and ahh-ed over cute and colorful glass. I was forgiven, but, as I said, I don’t think this mistake will ever be forgotten. 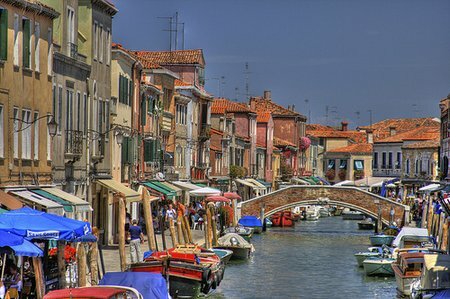 This entry was posted in International Escapades, Italy and tagged Italy, Murano, Vaporettos, Venice on April 9, 2009 by wandermom. The joys of depending on the Italian train system. We had planned to have a lazy Monday morning in Lucca relaxing after a busy (wedding-filled) weekend, possibly catching an afternoon train towards Venice. Unfortunately, when we arrived at the train station on Sunday afternoon to purchase tickets, we were told that there would be a one-day, province-wide train strike the following day and that if we wanted to get to Venice on Monday, we’d have to catch the 6:30am train. The following morning, for two kids who were still recovering from jet-lag, my boys were troupers as we woke them early and bundled them into a taxi to the train station. Hence, we arrived in Venice late Monday afternoon, tired and just a little cranky. We found our apartment off Campo S. Angelo with little trouble, dumped our bags and headed out for our first wander around the city with no agenda other than to stretch our legs after a day on trains and to find something to eat. Small and quiet, S. Angelo is in the San Marco sestiere but slightly away from the main “tourist trail” which runs from Piazza San Marco to the Rialto bridge. We followed our noses rather than a map, generally heading south-west towards the famous piazza to try to get a first glimpse of the Basilica di San Marco in the pre-dinner quiet. Our walk led us through Campo San Stefano past some restaurants which were just arranging their outdoor seating. It’s funny to think that these squares are called campos because they were once fields – in a city which is now battling to stay above water. For a visitor, Venice is a truly confusing city in which to orient oneself with mostly small cobbled streets, an unintelligible addressing system and, of course, canals. 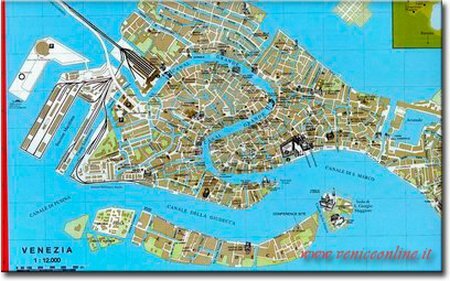 I had no idea that this was the case when we had set out earlier, The Rough Guide to Venice confidently in hand, sure that we’d easily find one of the recommended restaurants. Hah! After a fruitless attempt to find one or two of the suggested establishments, I conceded to the urgency of the “Mom, I’m hungry” cries and instead we returned to Campo San Stefano where we ate a decent, reasonably-priced meal at Ristorante San Stefano. As we relaxed over coffee after our meal, I studied the map in our guidebook, trying to commit the general layout of the city to memory. The boys were exploring the piazza – which is just the right size for enabling some independence, but not so large that they could disappear out of view. Although, when they came barreling back to us at top speed having ‘discovered’ a gelateria at the other end of the square, there was no way we could miss them.The Gelateria Paolin is one of the city’s oldest gelateria and is world-famous for it’s pistachio gelato. An excellent way to end to a busy day. This entry was posted in International Escapades, Italy and tagged Campo San Stefano, Italy, Venice on April 7, 2009 by wandermom. This entry was posted in International Escapades, Italy and tagged Italy, Murano, Vaporettos, Venezia Santa Lucia, Venice on April 5, 2009 by wandermom. Sometimes you snap a photo and a caption just pops into your head. Well, it does for some people. I’m lucky if I remember to bring a camera – not mind actually managing to take photos with it. But thankfully, the WanderDad is camera-happy and a witty soul to boot. 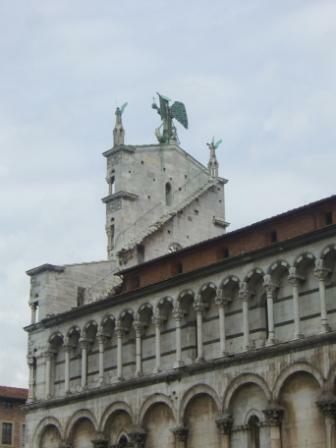 The photo above is of the church of San Michele in Lucca, Italy. Lucca is a delight to visit, not least because the piazza around this church is a perfect Italian piazza replete with cafes to lounge outside while watching children delightedly chase pigeons over the cobblestones – for hours. A recipe for a perfect (family) vacation afternoon. 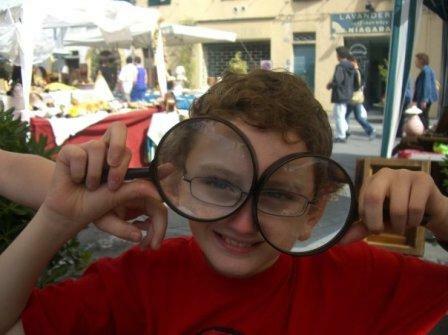 This entry was posted in International Escapades, Italy, Kid Travel Photos and tagged Italy, Lucca, Piazza San Michele on March 5, 2009 by wandermom. Well, not my camera exactly, the WanderDad’s camera. It was a Christmas gift from me to him, and it was the only camera we had with us on our trip to Italy. But it was stolen. There’s nothing particularly remarkable about this camera. 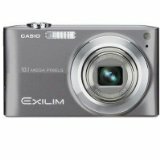 It’s a simple point-and-shoot, takes good photos, and is easy for even me (the non-gadget-geek in our household) to use. The camera was stolen in Venice in June and I’m still mad about it. We had just spent five days in the city, relaxing and wandering, and generally getting to know our temporary home. Our kids were settling into the travel routine and becoming proficient in ordering their own food, drinks and gelatos in Italian. We had taken a ton of photos. This is unusual for us, we’re very in-the-moment people who are much more likely to bask in the sun watching our kids explore a piazza – just enjoying watching them play – than to even think about taking the camera out of it’s bag. Perhaps a year before our trip, BigB had read Carnival By Candlelight and so, he was truly excited to visit Venice. I do think he thought he would see a flying lion. When we got to Venice, he was disappointed by the hustle of the vaporettos and the distinct lack of costumed characters in masks and flowing cloaks. With a little digital photography magic, the WanderDad took a photo of him with the lion from Basilica San Marco in the background, making it appear as if they were standing side-by-side. And so began our photo journey through Venice. The kids posed and preened in all kinds of places. We avoided much of the usual tourist paths through the city and instead wandered around the neighborhoods, exploring and photographing as we went. And then, the day before we left, we ate an early dinner in a little pizzeria just off Campo San Angelo. So early the pizzeria was practically empty. When we were done eating and had paid, we gathered up our things and left – leaving the camera bag behind. We realized the mistake within 30 minutes and rushed back to the pizzeria – which was no busier than when we had left it. But the camera was gone. I could rant for a moment about the probability that the camera was taken by our waiter and how dishonest it was for him to plainly lie when we returned asking if he’d seen the camera, but I won’t. Instead, I’d like to take a moment to praise the Found Cameras and Orphan Pictures blog. Matt Preprost, the owner of this website, posts photos from found cameras and memory cards weekly on this site. You can search for your lost camera or photos using the location in which it might have been found. There’s an interview with him on how he came up with this idea on YouTube. It’s a great use of technology and the internet. Yes, it is like having a giant lost-and-found board, but it’s also an admirable way to reunite people and memories. My request to you ? Spread the word. We’re not likely to ever be reunited with our Venice photos (since they haven’t shown up as yet), but knowing about this service can only make it better and that, may one day, help you or someone you love. This post is part of the Monday Dreaming series by MotherOfAllTrips. This entry was posted in International Escapades, Mom Talks Tech and tagged ifoundyourcamera.blogspot.com, Italy, Venice on October 5, 2008 by wandermom. 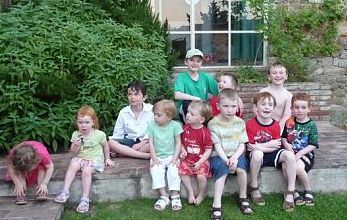 This entry was posted in Advice And Resources, International Escapades, Italy and tagged Accommodation, Agriturismo, Fattoria Maionchi, Italy, Lucca, Multi-Generational Travel, Property Review, Tuscany on September 9, 2008 by wandermom. I’m really enjoying hunting through my photos looking for wierd and whacky ones to include in Debbie’s Photo Friday on DeliciousBaby. CAM, with the treasures he found at the Lucca flea market. Here’s what happens when you let your kids loose in a flea market in a city in a another country: they buy stuff. Not souvenirs, not momentos, just stuff. The magnifying glasses made it home to Seattle safely. You’ll be glad to know. This entry was posted in International Escapades, Italy and tagged Italy, Lucca, Lucca Flea Market on September 5, 2008 by wandermom. I like Radisson SAS hotels. Maybe it’s the clean, sparse Scandinavian styling – almost as far away from my cluttered home as you could imagine. But, we didn’t plan to stay at the Radisson in Rome. It sort of happened by accident. We left Lucca, having just spent a fun but busy week with family, and decided to chill at the beach for a couple of days. I was a little disappointed that I wouldn’t get to see my kid’s faces as they explored the Colloseum, but it was hot, really hot and our attempt at sightseeing in Florence a couple of days earlier had been a disaster – because of the heat. 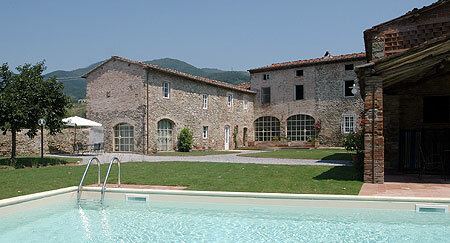 Who expects temperatures over 90F in Italy in June, really? We took the train to Viareggio. Alas, we weren’t the only ones planning to hit the beach that weekend and there wasn’t a single hotel room to be had in the town. Where to now? Our kids were hot and sticky, sitting on their backpacks on a parking strip facing a beach, waiting for us to tell them it was OK to strip and dash into the water. But it was not to be. We had wanted to leave the last few days at the end of our trip unplanned. I don’t think either of us had imagined this happening. Maybe Rome wouldn’t be so bad. I started reading the hotel listings in our guidebook. When I read that the Radisson had a pool, I flipped open my phone. Yes! They had a room available which would sleep four. The price was steeper than I would normally even consider, but this was a situation which required extraordinary measures. Location. Right next to the Termini Station. This might have been a problem except that its at the far end of the platforms, so the noise is not a problem. And you can walk across the street to get a Metro. Extremely handy if you’re a tourist trying to use only public transit. Room Size. We stayed in a hotel in London last year with a pull-out sofa for the kids. When the sofa was out, you couldn’t actually walk between the bed and the sofa. Teeny. This room was positively American in size. Cleanliness & Service. Scandinavian, duh! Well, with a slightly Italian twist. The Pool. 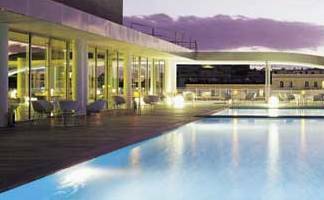 Turned out to be a full-size, unheated, roof-top pool. A perfect place to lounge about at the hottest part of the day. Location. The area around the Termini Station can be a little seedy. We spent our time either by the hotel pool or out exploring some of the prettier neighborhoods of the city. Frightening electrical work in the hotel room. When you pulled a plug out from a socket, sometimes the whole socket came too – leaving wires carrying 200v dangling out of the wall. Not the safest around children. The showers in the gym were cold. Not that I was using the gym or anything, but our room had a bath but no shower. When we’d checked in, I’d been OK with a bath thinking to myself that I could just use the showers in the gym if I really felt I needed a shower. Three cold showers later I was not impressed. We found it a good base from which to explore Rome especially since we had a limited amount of time. The mini-suite which we used (sleeps 4) costs about $450/night – we did get a slightly reduced rate since we were booking last-minute. Alternatively, we were offered two adjoining rooms for $300/night each. There was a complimentary breakfast buffet every morning. This went along way towards offsetting the cost of the hotel in my mind – two pre-teen boys can eat a LOT of food. This entry was posted in Italy, Mom Talks Tech and tagged Accommodation, Hotel Review, Italy, Radission SAS Rome, Rome, Rome Hotels, Rome Hotels With A Pool on August 23, 2008 by wandermom. a theme park in Rome ??? I came across Disneyland in Rome (crazy idea) today on MSNBC. At first I thought it was a joke: I mean, seriously, who would think that Rome needs a theme park ?? There’s so much to see and do in the city already. But, it seems like this is something which is actually being considered. Rome, with over 6 million tourist arrivals annually, places 8th in Euromonitor’s Top 150 City Destinations 2007 rankings. The cities ahead of Rome in the tourist stakes include London (top spot, 15 million tourists), Paris, Bangkok and Dubai. All the same, will a theme park make that much of a difference ? I’m a target customer for this planned ‘family-friendly attraction’ which aims to ‘show tourists what life was like in the Rome of 2,000 years ago’. I just spent some time (not enough) in Rome this past June. With husband and kids in tow (CAM and BigB, 12 and 8). We were hard-core tourists for four straight days. Your eyes would spin if I listed all the (existing) attractions we visited. Those were tiring days. We had a fabulous time. Now, if you ask them, my children consistently rank Rome as their favorite place in Italy. Would I have squeezed in a Roma-Disney if it were there? No. Not now. Not ever. Still thinking about Rome and theme parks, this evening, I asked my kids what was their favorite thing about Rome. 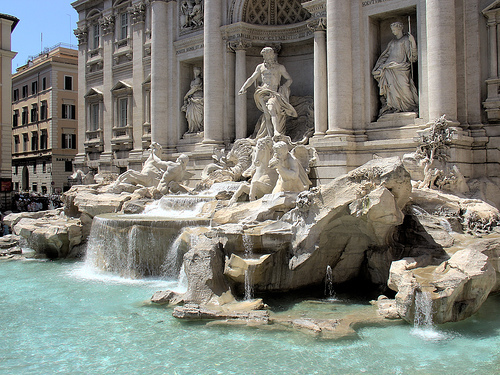 BigB said (and I am quoting here): “The Trevi Fountain. I just think that all the different places where the water comes out symbolizes many becoming one like everything coming together”. Wow. I’m impressed. CAM is a yard sale junkie. He chose the Porta Portese market as his top pick to visit before we got to Rome and it was top of his list today. (Although I can tell you he was utterly intrigued by the Colosseum – especially the lewd 2,000-year-old graffiti). My vote for the Lazio area council: don’t bother with the theme park, you’ve got enough going for you already. Spend the money on keeping your city clean. Expand the metro. Police the buses to keep the pickpockets under control. Rome is a unique place, don’t spoil it. This entry was posted in International Escapades, Italy, News And Views and tagged Italy, Rome, Rome Theme Park on August 14, 2008 by wandermom.